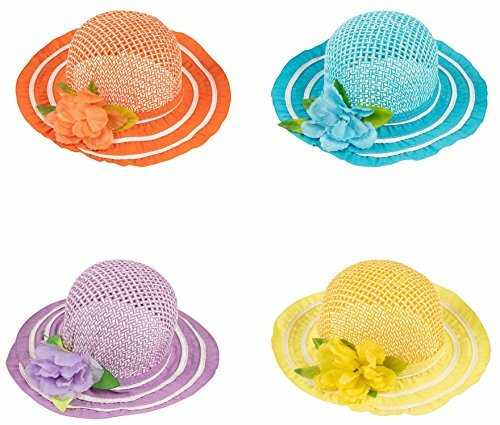 Garden parties, tea parties, or simple summer days out in the sun wouldn't be complete without this 4-pack of unique and beautifully designed tea party hats. Straw hats are back in fashion and they're going to be all the rage at your next tea party! Each hat features a matching flower and ribbon, and with four different colors to choose from, your children will find one that suits them perfectly. GARDEN PARTY HATS: Perfect for a garden tea party or girls' dress-up event. MATCHING FLOWER & RIBBON: Cute, elegant design for each of the four hats. VARIETY OF COLORS: Let your children switch up their style and share the four different colors available. Colors include orange, blue, purple, and yellow. GREAT PHOTO PROP: Straw hats make for great birthday party and other celebration photos for lasting memories. DIMENSIONS: Each tea party hat measures 7.25 inches in the diameter of the head and 5.25 inches in depth. Fits children ages 3-9.